If you could go back in time...and witness any event...where would you go? When Dr. Tom Greenbaum faces that question after successfully discovering the secret to time travel, he knows the time, place and event he will witness: the death and failed resurrection of Jesus Christ. Dr. David Goodman, Tom’s colleague and closest friend, follows Tom into the past, attempting to avert a time-space catastrophe. Forces beyond their control toss them into a dangerous end game, where they are tempted by evil characters, betrayed by friends, pursued by an assassin from the future and haunted by a demon that cannot be killed. 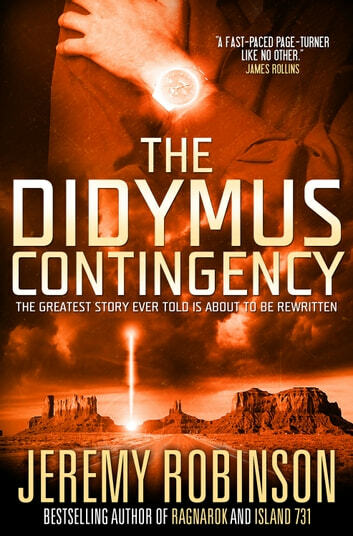 This updated edition has been re-edited, revised, repackaged and expanded, making this new edition of THE DIDYMUS CONTINGENCY superior to all that came before. Be sure to look for Robinson’s early standalone novels, which have likewise been revised. 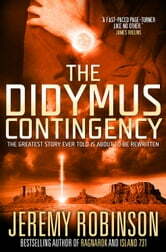 Very good book, interesting premise, believable characters. Great book from beginning to end? A page turner for sure, exciting. I would highly recommend this book and others by this Author. This book was interesting, fun and at times a little freaky. Which let's face it, is what Jeremy Robinson does best. I didn't really know what to expect from this book but having heard a lot of positive things about it thought it was high time I gave it a go. I can see why the book got so many positive comments and why so many people consider it to be one of Robinson's best work to date. It really grabs your attention and doesn't let go until the final page.